Paula Saunders’ debut novel The Distance Home is the story of a brother and sister, and how their parents shape the people they become. 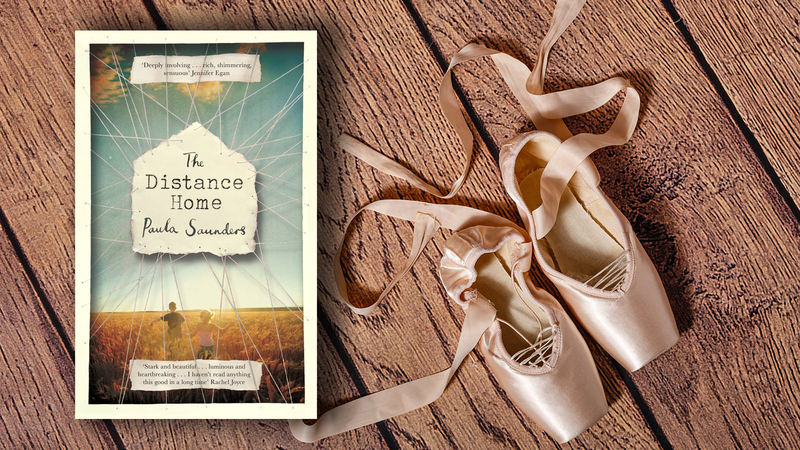 Paula Saunders’ first novel The Distance Home follows the lives of siblings Leon and Rene, who both share a talent for, and love of, dance. While their father admires this talent in his daughter, he despises it in his son. The Distance Home is a beautiful, sad and moving story of how our parents shape the people we become. Read an exclusive extract from the book, here. Eve got a call from Al. He’d invited an “important rancher” from Montana for dinner. They were on the road and would be arriving soon, so Eve should get some dinner ready, he said. They were all in a panic. She flew, and when Al and the important rancher and his wife pulled up, forty-five minutes later, everything was ready: the chicken was in the oven, the table was set, Eve had on a pretty dress and fancy apron, with her hair pinned back, and the kids had clean clothes, freshly washed faces, and real smiles at the excitement of company. Al had even brought home a bottle of chokecherry wine from some farmer friend of his, and Eve walked right over and gave him a kiss. The grown-ups sat in the living room and talked, drinking the sweet wine and commenting on the beautiful view, the twinkling lights of the city. The doors were wide open, letting in the fresh, pine-heavy air. It felt cozy and comfortable and safe with so many people talking so nicely, with Eve and Al so cheerful, laughing at the important rancher’s jokes, and Al telling some good ones of his own. Dinner went off without a hitch. There was oven-fried chicken, mashed potatoes and gravy, carrots and peas in ginger sauce, salad with homemade dressing, and cranberry jell. René couldn’t help but wonder where all this food had come from. Before Al had called, it was looking like they were going to have hot dogs, pork ’n’ beans, and carrots for dinner again. Jayne got down from the table first and went out onto the patio with Chuck. Then Leon got up to follow. “Get back here and clear your plate, Leon,” Al called after him. Leon was on his way back to the table when Eve grabbed his arm and pulled him close. “Leon had a solo tap dance on television, right here in Rapid,” she said to the company. “So did I,” René put in, and Al smiled. Leon shrugged, embarrassed, then glanced up at Al, who immediately dropped his head to examine his napkin. “My,” the rancher’s wife said, blinking. “Well, isn’t that nice.” The rancher looked to Al, who continued fussing with his napkin as if he were considering reweaving it. “Why not show us?” the rancher said. Al raised his head. So Leon brought Chuck inside, with Jayne following after. He held a piece of leftover chicken and said, “Sit,” and Chuck sat, then “Shake,” and Chuck lifted a paw. The rancher chuckled, and Al started to grin. Leon walked around the table three times before coming back to Chuck and finally giving him the chicken, which made the rancher and his wife laugh. Eve laughed and applauded, while Al laughed and kind of blushed. “Oh, sorry, so sorry,” Eve said. “Here—” She jumped up and got a damp cloth for the rancher’s wife, who dabbed at the shoulder of her dress. “Jesus Christ,” Al said, his face on fire. “Damn dumb Indian.” “Oh, now, Al,” the rancher said, laughing. Al gave a half-hearted grunt of agreement, Leon went outside, Eve retired to the kitchen, and the room went terribly quiet. Al looked at her, vacant and pale. “And what on earth is a walkover?” the rancher’s wife said, as if she were wondering what indecency was going to be perpetrated against them next. “I have no idea,” Al said, looking at the important company as though he’d just awakened to the sound of shattering crystal. René got up and unloaded her entire repertoire of gymnastics: a walkover, then a one-handed cartwheel, a headstand, an arching chest roll, the splits, a backbend, a back walkover, and a headstand with the splits. As she was going along, Al began to get his color back, and the rancher and his wife began to nod their heads, until everyone seemed pretty darned cheerful again. “Dessert?” Eve said, coming back from the kitchen, her eyes looking almost like she hadn’t been crying but for one light streak of mascara. She was right on cue with a beautiful strawberry short- cake, complete with whipped cream. Whipped cream? René thought. Where’d she get that? Leon was out on the patio, sitting on the ledge, his legs hanging down to nowhere, his arm around Chuck. René went out to get him. So she left him, and he sat by himself, looking out at the dark, starry night as the rest of the company shared in dessert. The Distance Home follows siblings Leon and Rene as they grow up in the 1960s amid the love and turmoil of their family. Both talented dancers, their upbringing tragically takes them down very different paths. This moving novel of devotion and neglect is impossible to put down.